The balance of life and death must be kept at all costs.Having been a reaper as long as she can remember, Nivian knows that what she does is essential inmaintaining balance. After being assigned to a rushed mark she finds that there is more to this human thanany other she has encountered.Kain had been living an ordinary life without a second thought until he meets Nivian who turns his worldupside down. He is thrust into a world of hunters and reapers. The keepers of life and death have beenfeuding for centuries over a reason no one can even remember.With Kain having been marked for reaping, and Nivian being hunted, they forge a friendship and togethermust find the truth in order to keep balance in check. Wrong choices could destroy everything. As they journey they discover hidden histories, powers, and lies and truths that have been spun since the beginningof time. The consequence of failure, unimaginable. Nivian leaped over the edge of the bridge and landed with a soft tap on the surface of the water. Shereached down, pulled the soul of the driver up by the collar of his shirt, and stood him up next to her on topof the water. She took the driver’s hand, palm up, in hers and waved her other hand over his. Pinching theair, she pulled and lifted up to expose his life thread. His wide eyes stared unblinking, hypnotized by theglowing string of light. Nivian reached behind her and grabbed the scythe strapped to her back, and swung.With a slow, deliberate movement, Nivian sliced the human’s life thread. The light formed into a ball andhovered between them. She pulled out a small pocket watch and guided the life energy down to the watch.It sunk into it and disappeared. She snapped the watch closed and returned it to her pocket.“You should know better than to drink and drive. You could’ve seriously hurt someone.”He gaped at her, his mouth opened and closed like a fish.“Yes, you really are dead,” she confirmed and gave him an apathetic look as she turned away.“Are you … the devil?” he managed to sputter.“No, of course not. I am just the natural order of things,” she said, looking back over her shoulder. “Waithere. Your spirit counselor will be here soon to guide you to your afterlife. I have other jobs tonight.” Shespun on her heel and walked away, as she pulled her hood back up over her head and vanished. Being a reaper has its perks, but also its downsides.While on an assignment, Evander is caught of guard by an unmarked human. Captivated, he is unable totear himself away.This is why reapers don’t associate with mortals.Piper was ordinary, just a girl looking for love. And all she knows is that her current boyfriend isn’t it. Anunfortunate incident and a series of remarkable events turn her world upside down. But what she finds isthe last thing she ever expected—She finds herself falling for the least likely candidate. “Stop. He is gone.” Evander said calmly. Why would she waste so much energy on someone who had nochance.“Don’t tell her to stop,” Tony snapped.Oh, right. That guy was still here. Where was a spirit counselor when you needed one? And at that moment,she showed up.“Yeah, yeah, I know. Don’t tell me. I’m late, am I right?” She waved a hand in the air dismissively.“I should have known it would be you, Cassandra. Please take him.”“Don’t boss me around, you fancy assassin. I know how to do my job.” She bit out, then turned to herassignment. “Come on, life loser, this way.”“I’m not going anywhere with you.” Tony backed up and stepped on his body, trying to slide back in.Evander’s gaze flicked upward, the difficult ones always tried to return to their bodies. I seriously fell in love with the way Ali writes ever since I read about The Reapers after it was first released. And here are a few things to get to know her a little more. What were you before you became a writer? The same thing I am now. A photographer, receptionist, wife, & furmom. How did you feel after you published your first book? Excited, relieved, scared, but mostly I wasn’t sure what to do with myself anymore at that point. The excitement at getting a new idea for a story, and seeing the covers to go with it. I LOVE a good cover! Why did you choose to write fantasy among other genre? I grew up reading fantasy, it’s where my mind lives. The one idea I had for a contemporary story fell flat, for me. It just wasn’t my thing and I lost interest. Once I added in fantasy elements to my story ideas they took off. I now have about 29+ (and counting) ideas jotted down. What inspired you to write about the reapers? I wanted a story about something different than what was already out there. No one really writes about the reaper, and the idea of it being an organization amused me and it just kind of took off from there quickly growing into it’s own unique world. Who is the person you look up to the most as an author? Author Konstanz Silverbow. She’s awesome and a great friend. She has an amazing imagination, and can focus on writing like crazy! (I need to learn the ways of the writing force, she’s kind of my Yoda.) She’s also the one to inspire me to continue with my Reapers story after I wrote the first scene. Any particular habit that you do before and after you write? I can’t think of any. Every day is different. Unless coffee counts, then coffee. If you can be one of your characters, who would you pick and why? Nivian, because who wouldn’t want that cloak, and the ability to change your hair color? What are you currently working on that your fans should look forward to? Star Dust. It was originally planned as a stand alone, and is still someone of a stand alone, but there will be a few others in the series/same universe. All stand alones-ish. Who is the person who knows you best? My Mom. She’s states away from me and still knows every time I need to talk. Dream destination? Ireland. Because I love the green, and rolling hills, not to mention the accents. What do you do to relax? Read, photograph, play with photoshop, play with my dogs, watch movies, knit, or do something crafty. Singing or Dancing? Dancing, I even take a dance class. I don’t sing, and I won’t. Riding a horse or driving a car? That’s tough, I like horses better, but I’m so much better at driving a car. Sexiest man for you? My husband. Your present life in one word – Words. Ali grew up in the Pacific North West. She attended Oregon State University for photography. 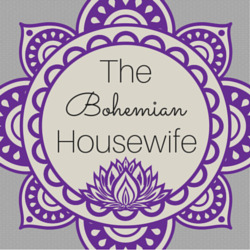 After manyadventures, she moved to Colorado, earned a second degree, and met and married her husband.She currently lives in windy Wyoming with her husband and two dogs. When not writing, Ali is either,photographing, knitting, reading, dancing, or staying inside where it’s warm with a hot cup of coffee. Shedreams of traveling the world someday soon. Event: Jan 9th 6pm-9pm MST. Come find out more and enter to win prizes! 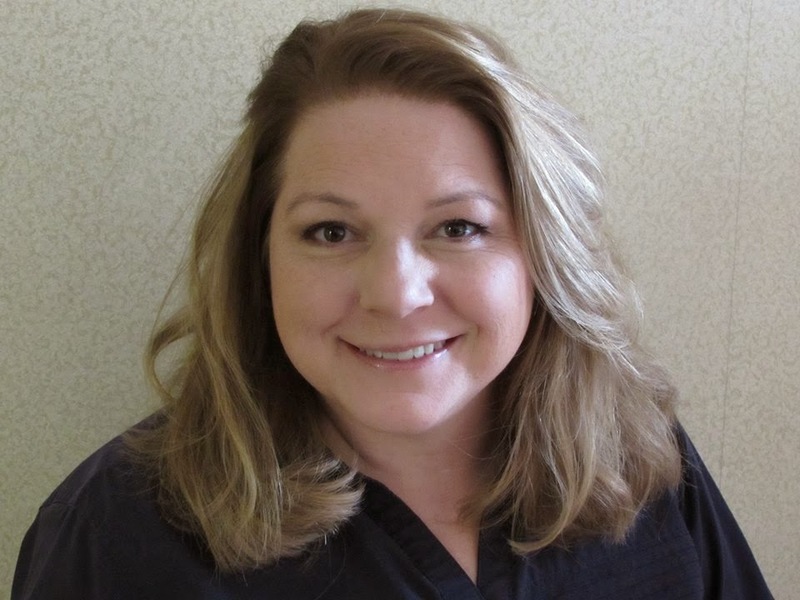 Today I had the chance to interview one of the few NA authors that I read… Melissa Pearl. I love how her novels always involve mystery and suspense that when you start reading, you can’t put it down until you get to the end. The first novel of hers that I’ve read and fell in love with was I Know Lucy which is part of The Fugitive Series. In celebration of her upcoming release The Spaces Beyond, a sequel to the novel The Spaces Between the Heartbeats, I requested for an interview which she gladly agreed to. To date, she has 23 books available in the market in kindle or paper back as well as other formats. Without further ado, here’s a few things for us to get to know her more. What were you before you became an author? How did you feel after you published your first book? Expectations? ~It was pretty exciting and nerve-wracking. It was really cool to have something online for people to read and I was getting really good reviews, so that part was excellent. If I’m honest, a small part of me was hoping for the Amanda Hocking effect, but I think I was realistic enough to know I wouldn’t get that. Trying to get noticed as an indie author has been much harder than I thought it would be. Why did you choose to write New Adult and Young Adult? ~I started writing YA because of being a teacher. I wanted to write something that students could enjoy. I didn’t like reading that much as a kid and I wanted to write the kinds of books that I would have loved. I got into New Adult last year, because I wanted to start working with slightly older characters. Their situations & circumstances are just a little different to high schoolers and it’s fun working with slightly older issues. Have you ever had a mental block before? If yes, how did you overcome it? ~ I get them sometimes during the planning phases of my stories…also sometimes during the middle. I tend to go for a walk or take a shower…or discuss it with my husband. One of those things will usually trigger a solution for me. What was your fist novel and what inspired you to write it? What is something in being an author that you can’t compare to any other job? ~I get to live in an imaginary world when I’m writing and I LOVE that!! It’s the best part about being an author for me and I couldn’t really get that anywhere else. Also – the writing community is awesome. There are so many creative, kindred spirits and it’s so fantastic connecting with these talented people who are just as passionate as you are. What is something you know now that you wish you knew before you started writing? How do you feel about having one/two star reviews (if there is any)? What is something your fans/readers should look forward to? ~True Love (A Songbird Novel) is coming out in November and I’m REALLY excited to share that with my NA fans. For my YA readers, I have two novellas coming out in October, which accompany the re-release of Betwixt…now entitled The Space Between Heartbeats (published by Alloy Entertainment). Food that you won’t ever get tired of eating? A place you haven’t been before but really want to go to? Is there something you are afraid of? Most mistaken impression people have about you? 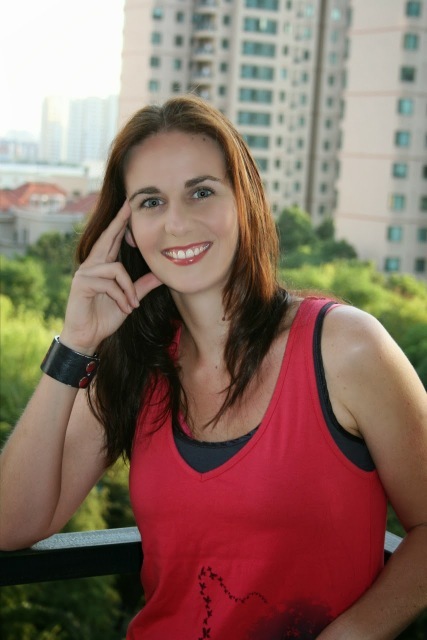 I hope you all enjoyed reading along my interview with Melissa Pearl. You can find a complete list of her books below. I had the honor to interview one of New York Times and USA Today bestselling author and I am proud to present with you all the interview I had with her. I can’t stop smiling as I go through the answers she gave for the interview. I can say very well that I learned some things I didn’t know about her before. I’m so glad I put on that big girl pants and had the courage to ask for this interview. Let me present to you all, Kathleen Brooks. Kathleen Brooks is a New York Times, Wall Street Journal and USA Today Best Selling author. She is the author of the series Bluegrass, Bluegrass Brothers and Women of Power. Her stories are complete package of not only romance but also suspense, humor and happily ever after. Her latest book The Keeneston Roses was released only last month. Her first book, Bluegrass State of Mind is free in all major e-book retailers and like most bookworms there’s nothing that excites me more than stumbling upon a free book. Even with lots of book that are already sitting on my kindle, I can’t resist them. And that’s how I came across Bluegrass State of Mind. However, as someone who is not from the south, not American even, I had no idea back then what ‘Bluegrass’ actually meant. Thus, the book didn’t pull any attraction to me. I had the book sitting on my kindle for some time and I didn’t pay attention to it. Until that one lazy afternoon almost two years ago. I finally asked myself ‘what the heck does Bluegrass State of Mind mean?’ and so I opened the book. If I have any regret, it is that I didn’t read the book sooner. The story comes into life right then as you start reading. More than reading the story, it felt like being inside the story. I love Keeneston, the Rose Sisters and every one in it. In my dismay, I learned that Keeneston was a fictional place when I researched about it. Here I was ready to move there and it’s not on the map. Well, that’s saying how much real Kathleen’s prose is. You see them, feel them, hear them, smell them and you’ll badly wish you can taste the foods that were mentioned there too. What year did you publish your first novel? I published my first book, Bluegrass State of Mind, in July of 2011. Before I was an author, I was an attorney. Being an author is a lot more fun! I was so nervous when my first book was published. I just wanted one person to buy it and find enjoyment while reading it. That feeling hasn’t changed much over the years. I still hope my readers find many hours of enjoyment as they read my books. There’s a lot of military men in your first series, what inspired you to write about them? There’s a lot of military men in my series because I’ve been around them quite a bit and I’ve been inspired by friends and family who have served. It takes a special type of person to be willing to put themselves in the line of fire to protect others. Do you follow a routine or do you have any habit before and after you write? I do follow a routine when I write. I have a child in school, so I write during school hours. I also have a special music playlist. I have a variety of different-paced music so when I am writing an action scene, I play certain music, like Kongo’s Come with Me Now. Or if it’s a more emotional scene I play Luke Bryan’s I See You. What is the best thing that happened to you as an author? The best thing that has happened to me as an author has been meeting people from all over the world, including other authors that I admire and, most importantly, my readers. I love hearing how my books remind people of home, whether home is in the United States, Ireland, Zimbabwe, Australia, or the Philippines. I love seeing that sense of global community as readers finish my newest book. All of that, plus meeting Nora Roberts! I love a job where I get to live in a dream and every story ends in a happily ever after. I never dread going to work. Instead, I’m always excited to get lost in my story. There are so many other authors that I’m lucky enough to count as friends who inspire me. There was a group of us that started out together, Ruth Cardello, Melody Anne, Cali MacKay, and myself. I also look up to Bella Andre and Liliana Hart for their incredible work ethic and willingness to help other authors. If you can be one of the Rose sisters which one will you be? If I could be any of the Rose sisters, I would be Miss Violet. Amazing cook plus she gets to have all the hottest men of Keeneston hugging her! As an author where do you see yourself five/ten years from now? I hope to be writing as far into the future as I can see. I have so many stories I want to tell that it will take me a lifetime to do so! Any words of advice to aspiring authors out there? The best advice I can give to aspiring authors out there is to write. Then write some more. The more you write, the more you find your voice. An author’s voice is what enables a reader to pick up a book with no cover, read the first page, and say, “This is a book by Kathleen Brooks.” It is who you are as a storyteller and the best way to find it is to just write. 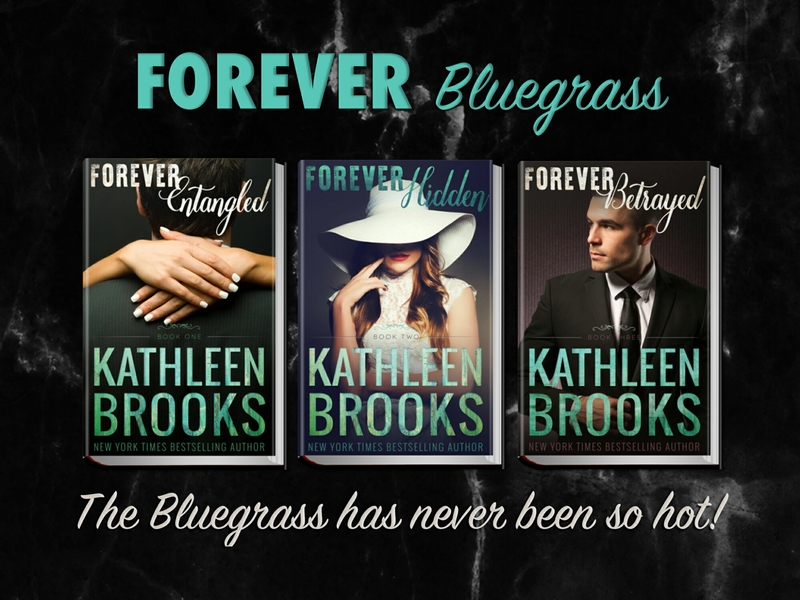 I am currently working on the Forever Bluegrass series. Book One, Forever Entangled comes out October 20th. Ryan and Sienna discover there is more going on than originally thought and now the two are in the fight of their lives. It doesn’t take long for fireworks to ignite as passion and danger drive the couple toward a fate they never saw coming before. Aside from knowing a little more about Kathleen as a writer, here are some little things about her when she is not writing. I like both spring and fall the most. I enjoy writing with the windows open and the breeze blowing in. I read. The perfect day for me is to curl up with the Hallmark Channel and a new book. Authors all start out as readers and we cherish getting lost into stories during our down time. I want to go to Bora Bora and stay in one of those huts over the water! Who’s the one person you enjoy hanging out the most with? My husband. He’s a great man and father. But, for pure sit back and laugh out loud girl time, there is a small group of authors who are very dear friends of mine that all live nearby. After we take our kids to school, we’ll have breakfast or go see a movie together. Our families have all gotten to know each other too, so our kids can roll their eyes at us while we embarrass them. Dogs, although I do also own a cat. Right now I’m really loving Scott Eastwood. Your present life in one word? Most people go gaga when they saw their favorite celebrities on tv. As a person who love books, I always felt so elated and have the ‘I can’t believe it’ sort of feelings when the authors I love talk to me, interact with me on social media or even like my comment or post. Getting to know Kathleen Brooks more through this interview, you can probably imagine how happy I am feeling now. But much more than that, it’s nice to know that the person I look up to loves some things that I do too (like chocolate) and that she still have time to curl up and read books even after writing really amazing ones. 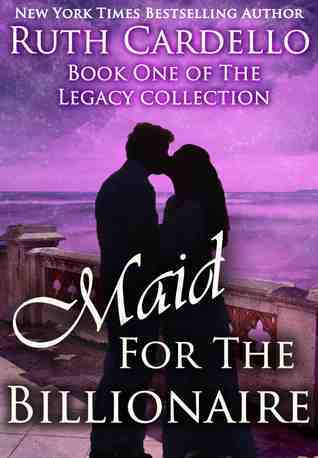 How I came across Ruth Cardello and Maid for the Billionaire. To those who are not yet familiar with her, Maid for the Billionaire was her first book. It was year 2012 when I found Abby and Dominic’s love story. My kindle was new and I just learned that the authors that I know about have their books on amazon at prices that are impossible for me. So I did the only thing I can do during those times, search for free books on Amazon. And there were loads of them! Maid for the Billionaire was one them. And out of all the free ones I downloaded, I decided to read it first because of the cover. I rarely choose a book by their covers. But I love purple (MFTB used to have purple cover) and the old cover just caught me and I started digging in. It’s not very different from other books that I’ve read. I’m fairly certain that I’ve read a book before that have almost the same plot. However, there’s something about the way Ruth Cardello wrote it that I became enamored with the series. That’s where it all started. After reading that, I can’t sit still until I read the next one and when a new book of hers is out, I definitely need to one-click it immediately. Why do I love Ruth Cardello? When it comes to her novels, I’d say, what’s not to love? She is an amazing story teller. There’s something in the way she put the words together that I feel them in my heart. And I love that each novel is not only about the hero and the heroine achieving their happy ever after. It’s about family, friendships, about learning who you are, getting through life’s hurdles and becoming a better you. Much more than the love story, I find myself looking forward to those words of wisdom each book of hers offer. Reading her books not only bring entertainment but a piece of advice or reminder of the things that matter in this life time that we usually take for granted. As an author, she’s a class act. I wish more authors act and behave the way she does. This indie world is not that big and I saw some people who keeps biting each other’s head off. With her, it’s always positivity and love floating around. I never saw post a single negative thing about an author, a reader, a blogger or a reviewer. I never saw her engage on a negative review or ask her street team to do that. As a blogger those are big deal. I’ve experienced being attacked by street teams because I was being honest on my reviews. As a reader, she’s really an inspiration. More so, I love the Serenity Chronicles she usually post. Those are like a ray of sunshine on a bad day. She’s also very generous. Not only with tangible means but more of the intangible ones. You can always see her posting appreciations to her readers, encouraging wanna be writers (I saw people actually thanking her for helping them) and spreading positivity. I don’t know about you but for me, an author’s attitude impacts whether or not I’ll keep buying her/his books. If the behavior offends me, I don’t hesitate to walk away. And with Ruth, I don’t ever see that happening. I actually planned for doing an interview to make this part more meaningful and well believable but I know she’s a real busy person and I’m to shy to ask if I can feature her. I don’t want to take her time away from writing just to indulge me to have something I could put on m blog. But I really want to share more about her so I’m sharing an interview she did with Huffington Post before. If she ever read this, I hope you don’t mind. If you haven’t try any of her books, I highly recommend you give it a shot. All the first books in two of her series are free/ Links are below.